GCU student Bre L’Estrange poses with students and staff at St. Vincent de Paul’s Dream Center. The Society of St. Vincent de Paul’s Dream Center coordinator, Cindy Bernardo, calls herself a “ricochet rabbit” — a fitting nickname for the leader of a place that in one hour can feed, teach and even shelter the Phoenix community’s children. 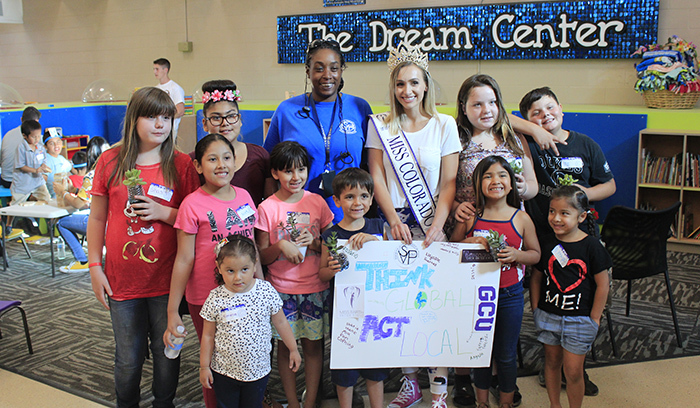 Bernardo made sure each child on June 21 who came to the center — one of Grand Canyon University‘s community partners — spent 20 minutes reading and writing before they went on to one of the activities offered that day. On any given night, 30 to 100 children stream through the facility, tucked south of the I-17 loop at 420 W. Watkins Road. It’s Bernardo and her team’s job to make sure the children are taken care of. A child gardens at St. Vincent de Paul’s Dream Center. Bernardo’s staff gets help from volunteers – a lot of them – some of whom show up day after day. GCU senior Bre L’Estrange was one of those volunteers June 21. She helped the center’s urban farm coordinator, Nika Forte, run the last session of a four-week class that taught children about gardening. L’Estrange was recently honored as Miss Colorado Earth, a designation she earned through her platform, “Think Global, Act Local.” She will compete in July to become Miss Earth United States. L’Estrange and Forte prepared a lesson plan that included having the children plant succulents in old plastic bottles. 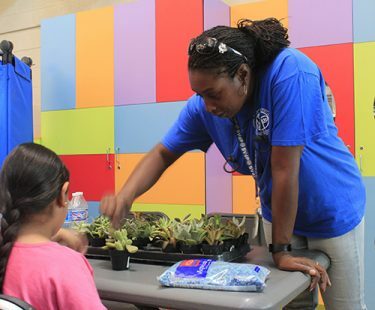 GCU student Bre L’Estrange teaches a gardening session at the center. L’Estrange said she went dumpster diving for bottles before the session to teach the kids how important it is to reuse. 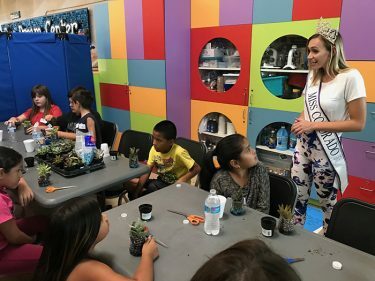 “I grew up in a very small town, and I really take pride in teaching kids about how small actions can make a huge impact,” she said. 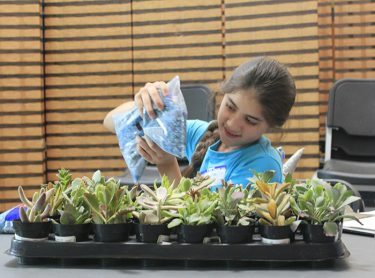 L’Estrange gave the children a presentation on how much plastic is wasted in the U.S. She and Forte then helped them plant succulents in bottles, which the kids were able to take home. Nika Forte teaches gardening at the center. Forte at a previous session gave the kids seeds to take home and plant. Her journey at the center began when she started helping the urban farm on a college externship. Her mother, a teacher, had been helping the center and told Forte about the opportunities there. So she went as part of her education, but when it was time to leave, she was offered a position to become a full-time member of the center’s family. That was three years ago and Forte hasn’t looked back. She leads three urban farms, growing food that goes into the center’s dining halls. The center uses all-natural methods and has community volunteers and even some of the center’s residents who help. University employees interested in volunteering can email the center for more information.